Due to poor planning on my part, I don’t have a guest author today. I’ll do better next week. 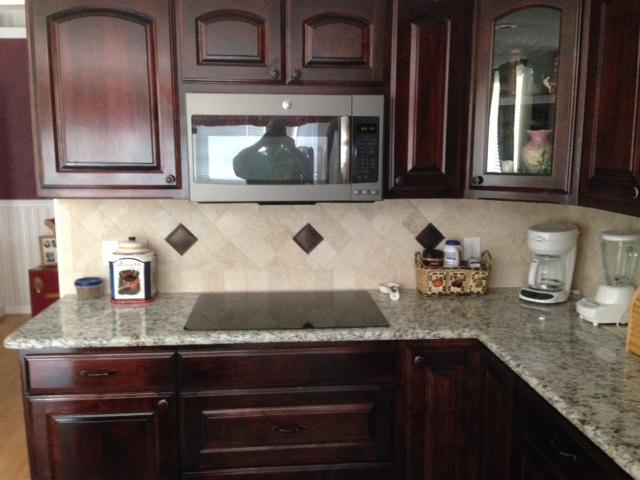 For now, I’ll share pictures of my remodeled kitchen, as promised months ago. At last! Maple cupboards are stained red mahogany, natural stone backsplash & “Dallas White” granite counters; slate-gray microwave and stovetop. 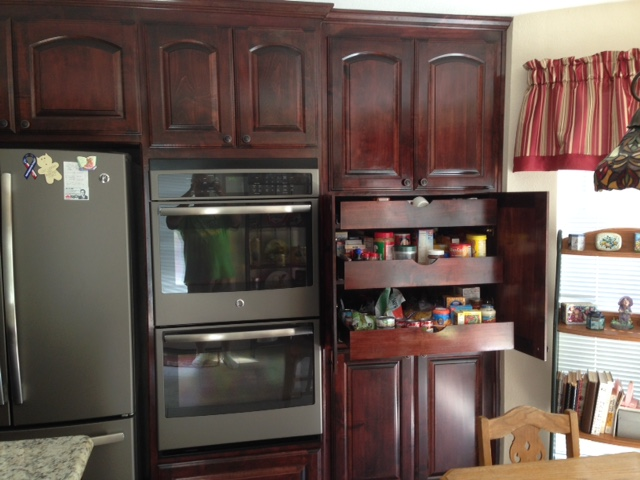 Most bottom cupboard are drawers, making it much easier to pull out kettles and bake ware. 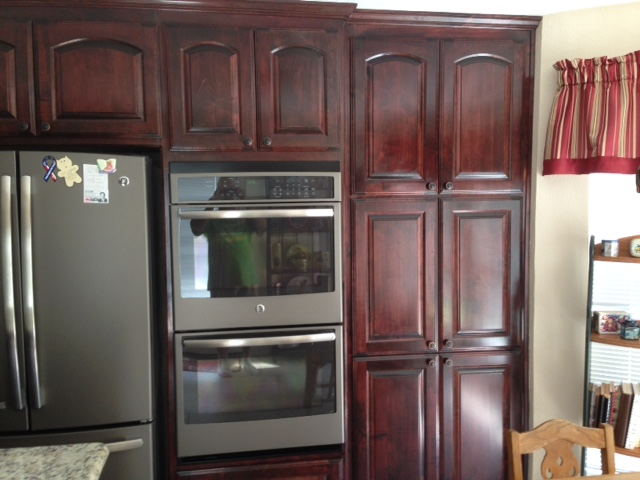 Matching slate double ovens (had to wait two months for them because GE just brought them to market in August.) To the right is the custom designed pantry. Surprise! The pantry has drawers, again making it easy to find and remove whatever I need. This was a suggestion from my friend, Carra Copelin, who had her kitchen remodeled two years ago — with handy drawers. Breakfast nook at end of kitchen. It overlooks our large backyard. 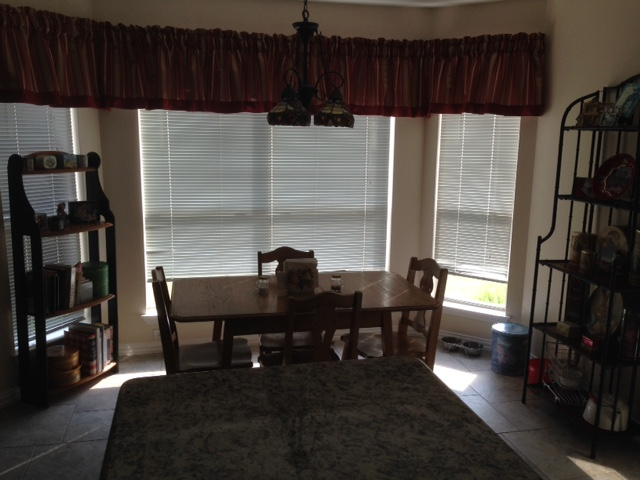 My husband had to close the blinds because it was so sunny and bright the day he took these photos. The table and chairs were my mom’s, dating to about the early 1930s. On either side you can see more tins. Sorry the picture is too dark to show their pretty designs and colors. Sink, dishwasher, and bar overlooking our living room. I love the new gooseneck faucet! That’s it for now. Monday Author Meetup will return next week. Until then, you can find me on Facebook and Twitter, and don’t forget to check out my books on Amazon. Thank you, Tina. The drawers make it easier to reach items, important with wobbly knees and hands like mine. We endured four months of mess and inconvenience, with workmen barging in and out of our house, but the results are well worth it. Beautiful! We remodeled ours several years ago, it was a major update- but so worth it! great post! Thank you, Camellia. Ours was major, too, and just about drove me crazy, but it is definitely worth the headaches. sure is nice~ really like the kitchen! I’m ready to do some renovations soon, too. :) Thanks for your ideas. Thank you, Mary. 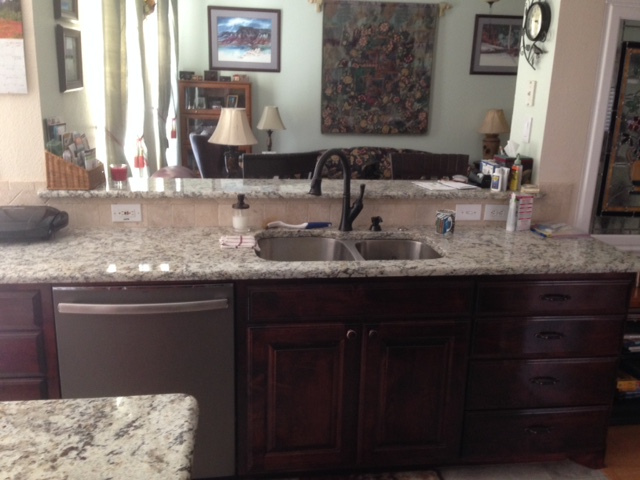 I love my new kitchen – so much more counter space and storage. Have fun with your reno! It can drive you crazy while happening but the results are worth it. Lyn, I like the color of the cabinets. Cherry, I think. It’s always a pleasure to give a home a fresh look and you’ve done a marvelous job. Thank you, Eileen. I love the color too, and am enjoying the extra storage space and big island. We had a very small one before. Thanks for stopping by. I hope you’ll visit me again. Very nice, Lyn! 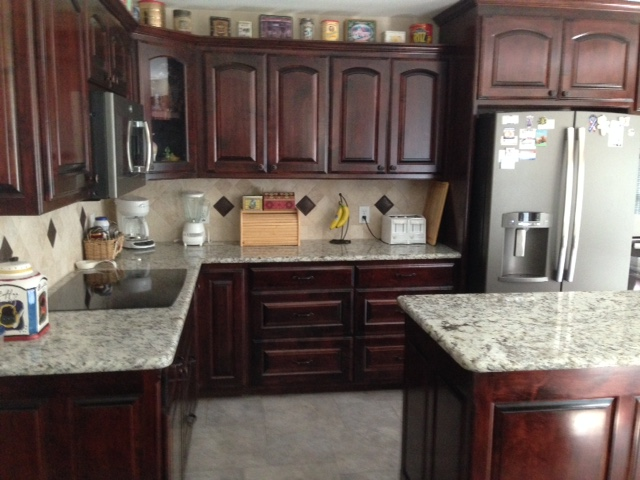 Beautiful wooden cabinets and granite counters. Happy for you! Thanks, Cheri. I meant to post pictures a long time ago, but one thing drives out another. Know what I mean? Lyn, What a great kitchen! Needless to say, I am green with envy. I would love to remodel our ugly kitchen, but it will have to wait. We do home improvements from my royalties, so we may never get the kitchen redone. Sigh. Thanks, Caroline. I guess you could say this was our anniversary, Christmas and birthday present to ourselves — for the next ten years!